Some people mistakenly believe that they do not really need a lawyer to get their divorce finalized. They may be hoping to save some money or they may be thinking a lawyer will slow down the process, so they opt to represent themselves (i.e. pro se). This is a big mistake you should avoid. If you are getting a divorce and have children, you and your spouse are required to create a parenting plan. This plan determines where your children will live, who they will spend time with and when (e.g., vacations, birthdays, etc. ), how financial decisions (e.g., college) will be made, how conflicts will be resolved, and so forth. Without an experienced divorce lawyer to guide you, there is a risk you end up with a parenting plan that deprives you of the ability to make certain parenting decisions or agreeing to pay an exorbitant amount of child support. You may be required to remove your spouse’s name from a loan title. Depending on your divorce decree, you may be required to pay off the balance on the loan. If you fail to remove your spouse’s name from the loan title, they can file a lawsuit against you if they are harmed by your failure to service the loan in a timely manner. The divorce decree is a court-issued judgment. Both you and your spouse must adhere to the provisions of the divorce decree. In many cases, the parties can negotiate and agree to the terms of their divorce decree during a mediation session or through a collaborative divorce process. Unfortunately, without a lawyer guiding you through this process, you may forget to include important stipulations within the divorce decree, or may not fully understand the orders in a divorce decree. This can impact alimony payments, selling your primary residence, dividing bank accounts and other financial assets, how debts will be paid, etc. Making a mistake in your divorce decrees is difficult to amend. To ensure that your divorce goes as smoothly as possible, you need to hire an experienced Houston divorce lawyer. The law office of Lindamood & Robinson, P.C. is here to help. 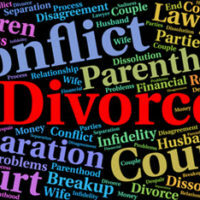 Our team of experienced and skilled Houston divorce lawyers can meet with you when you are ready. We are seasoned trial lawyers who know the ins and outs of the divorce process. Contact our office to schedule a consultation.